Today, the InnerChange Foundation has the chance to extend its reach, by bringing even more innovative practice to reality –focused now on the youth of our province. This means that vulnerable youth facing addictions and other related health challenges will now find it easier to get quality, integrated care. 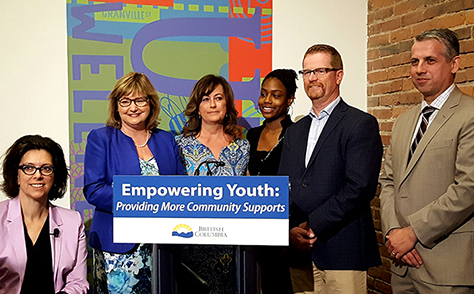 An announcement by Ministers Terry Lake and Stephanie Cadieux, and Parliamentary Secretary Jane Thornthwaite revealed the full extent of the new BC Integrated Youth Services Initiative (BCIYSI). Thanks to an exciting collaboration between InnerChange, the Graham Boeckh Foundation and St. Paul’s Hospital Foundation, BC will gain five new service centres providing much-needed multi-disciplinary primary health, psychiatric, psychological, addiction, social, vocational and other services for youth between the ages of 12 and 24 years old. The availability, breadth and scope of such services in an integrated format is unprecedented in Canada. And this is just the beginning. To learn more, please see the press release below. Please consider supporting InnerChange one way or another. 100% of donations earmarked for the BC-IYSI will go directly to the project.